Food Blogga: Who Doesn't Love Betty Crocker's Cooky Book Recipe for Lemon Poppy Seed Cookies? Who Doesn't Love Betty Crocker's Cooky Book Recipe for Lemon Poppy Seed Cookies? Some flavor combinations never go out of style, like chocolate and peanut butter, cranberries and orange, and lemon and poppy seed. I grew up eating (and loving) my mom's lemon poppy seed muffins -- big, moist, hill-topped treats that were covered in sweet, tart lemon icing. Walk into just about any bakery or coffee shop today, and chances are good that you'll find some kind of lemon-poppy seed baked good: muffin, scone, cake, or cookie. Maybe it's because they have old-fashioned charm, or maybe it's because they're appealing to just about everybody. Really. Have you ever heard of someone turning down a slice of lemon poppy seed cake? You'll have a hard time turning down today's recipe for Lemon Poppy Drop Cookies with Poppy Seed Glaze. The recipe is slightly adapted from an original in the iconic 1963 Betty Crocker Cooky Book. I remember my mom making many recipes from the Betty Crocker Cooky Book, but I don't remember if lemon poppy drops were one of them. No doubt, after reading this post, she'll be making a batch. You might too. After all, have you ever heard of someone turning down a glazed lemon poppy seed cookie? This recipe is slightly adapted from the original. 2. For the cookies: In a large bowl, mix sugar, butter, and egg. Stir in remaining ingredients. 3. Drop dough in heaping tablespoonfuls about 2 inches apart onto an ungreased cookie sheet. Bake 10-12 minutes, or until the edges are golden brown. Transfer to a wire rack. Cool completely before glazing. 4. For the glaze: Whisk all ingredients in a small bowl until smooth. The glaze should cling to the back of a spoon. For easy clean up, place a sheet of parchment paper underneath the cookie rack before glazing cookies. Drizzle glaze over cookies. Allow to cool completely until the glaze hardens. Cookies can be stored in an air-tight container for up to a week. 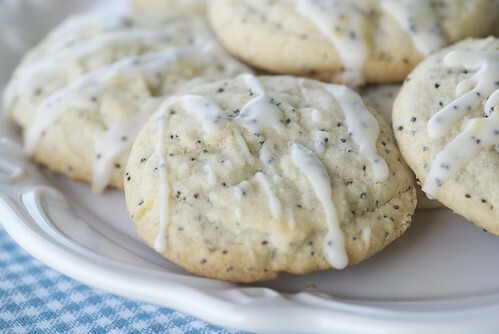 I love lemon cookies and the lemon with poppy seeds and no I would not turn down these cookies! Those cookies look really good! Impossible not to love such a recipe. I love this flavour combo. Poppy seeds have a deliciously nutty flavour. My grandmother used to make "Makovnik" - an eastern european strudel type cake filled with ground-up poppyseeds mixed with sugar. I've heard that you can test positive for opium by just eating a poppy seed bagel, so I don't know what a Makovnik would do to your opium-level readings! Anyway, I like the new pic of you. You remind me of Winona Ryder! I never got lemon baked goods when I was growing up because my dad HATES lemon in anything. Now I'm making up for lost time and making all sorts of great cookies and cakes that are full of lemon...and these cookies will be next! I am not really used to seeing cookies that are not brown. Maybe because I never tried eating them. So, this is going to the next thing that I am going to do come weekend! Classic cookies with a yum flavour combination! Love the glaze too...yum Susan, I love them! I love the new photo of you Susan! been a fan of poppy seeds, but I have to say these sure do look good! One of my favorite flavor combos. I can't wait to make this! I have never tried poppy seeds in cookies, but these look great. Thanks! What a great idea - love these flavours in muffins but it's often too much volume. A cookie, now I could handle that! Anything with glaze dropping off of it like that has got to be good! I loved that cookbook as a child! Lemon and poppyseed is a combination that never goes out of style. These look delicious! I haven't made anything with poppy seeds in forever... I used to have a great recipe for a lemon poppyseed cake. The cookies look so refreshing! Those look lovely. I love poppy seed cake/pound cake, but I have never tried cookies. The poppy seed glaze sounds really good. I think we own the Betty Crocker Cookie Book - it's old and falling apart, but so charming. Makes me want to just spend the afternoon at home with some cookies and a cup of tea! I love lemon poppy seed anything. Everyone seems to be baking cookies today. Looks delicious! I got that cookbook as a wedding gift, but I've yet to crack it open. Love this combo! gudrun-Lemon cookies are some of my favorites too. kitchentables-White and pretty! Hope you try them! deeba-I love the glaze too! xiaolu-Let me know how you like them! katie-Oh, you've got to try some then! mardi-They're just the right size. deborah-I love to lick it off my finger too! karen-Then this is perfect timing! erika-They dust it off and start baking! nuria-No? Well, try them once, and you'll be hooked! abby-Crack it open! You'll love it. I promise. These sound so good, I pretty much like all things lemon. Will be bookmarking this. I remember that poppy seed is very pricey when I lived in NJ (4 dollars something for that tiny McConmick plastic container), so I didn't explore too much those recipes with poppy seed. Now here for some reason it's so cheap, I'd love to indulge myself... start off from your lovely cookies! kawaii-I'm so glad you like them. I found you through The Devine Home. 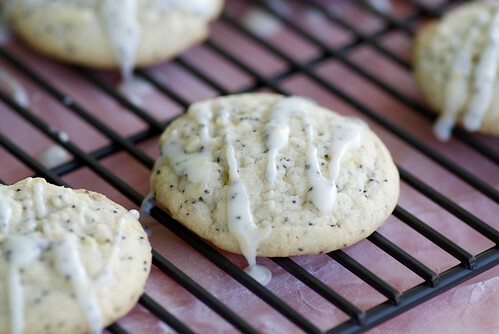 These Lemon Poppy Seed cookies look wonderful and I will try them. Thanks! On what page in Betty Crocker Cooky Book did you find the Lemon Poppy Seed Cookies. I have been looking for them in my book. They look so good. On what page did you find Lemon Poppy Seed Cookies in the Betty Crocker Cooky Book. I can't find the recipe in mine. They look so good.